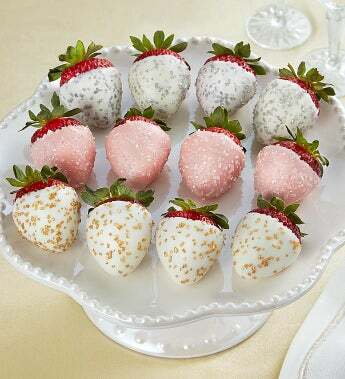 It’s the taste of luxury, of festive parties and elegant revelry, of divine strawberries paired with bubbly champagne! 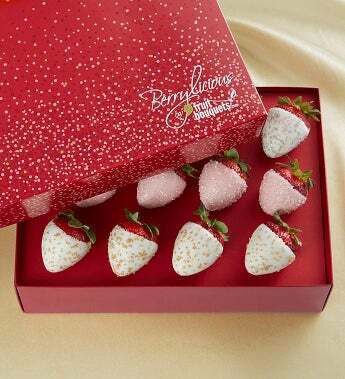 In this lavish collection, each giant, hand-picked strawberry comes generously dipped in creamy white and pink champagne-infused real chocolate and decoratively sprinkled with gold, platinum and clear sugar. Ready to celebrate? It’s the taste of luxury, of festive parties and elegant revelry, of divine strawberries paired with bubbly champagne! 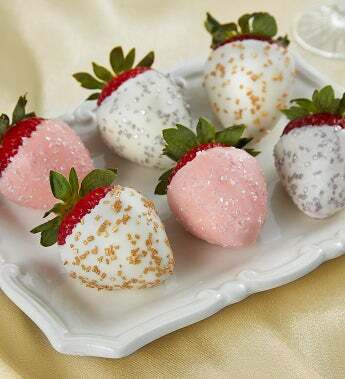 In this lavish collection, each giant, hand-picked strawberry comes generously dipped in creamy white and pink champagne-infused real chocolate and decoratively sprinkled with gold, platinum and clear sugar.